Our view for most of Day 3’s drive. This was not quite as long a drive as the previous day, but it was the least interesting day of driving. It was westward across western Oklahoma on I-40, then we turned northwestward in Amarillo taking U.S. highways (instead of interstates) towards Raton. 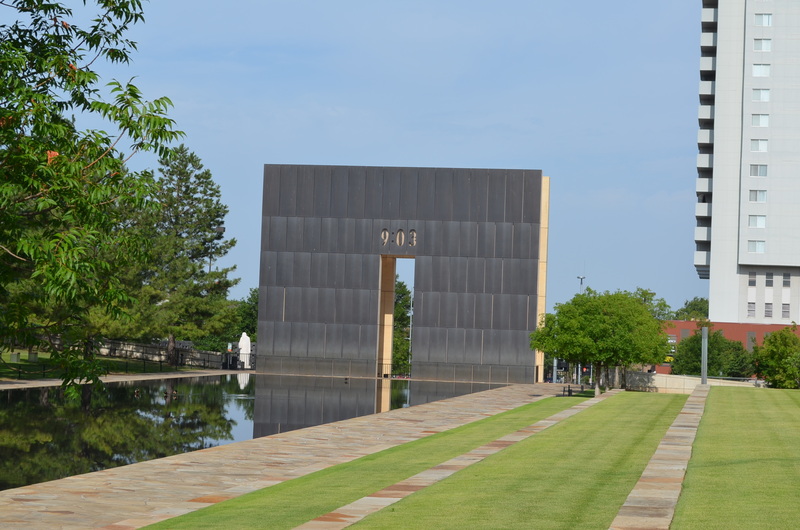 Before we hit the road, though, we took a few minutes to visit the Oklahoma City National Memorial, which is a park at the site of the former Alfred Murrah Federal Building. 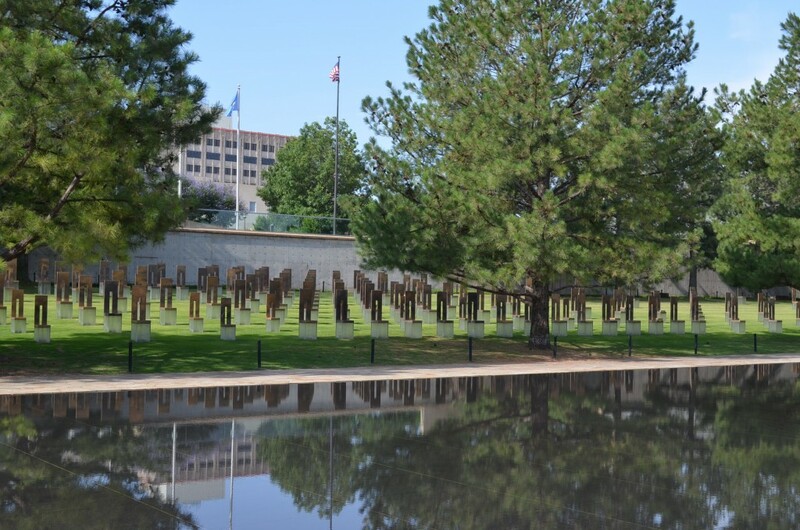 The memorial is very beautiful and very well done. We visited at about 8am on a Sunday, so it was nearly empty. 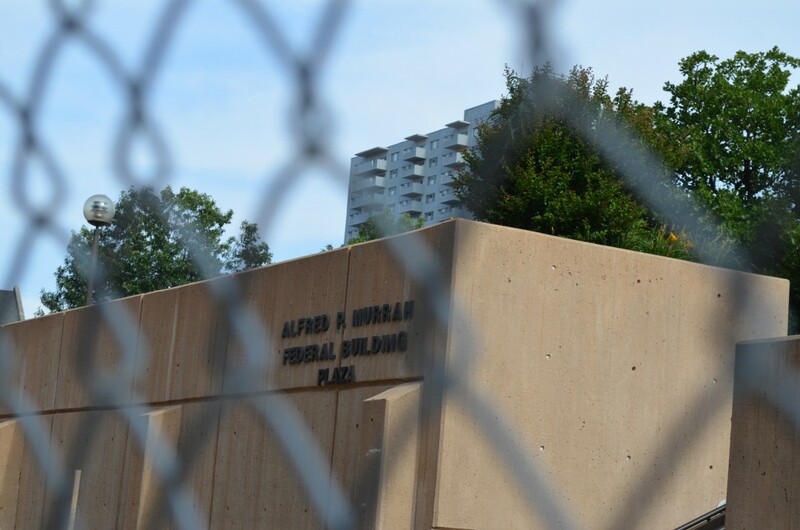 It’s sunk into the basement of the former federal building, and evidence of the bombed building can still be seen. They preserved the foundation of the original federal building. 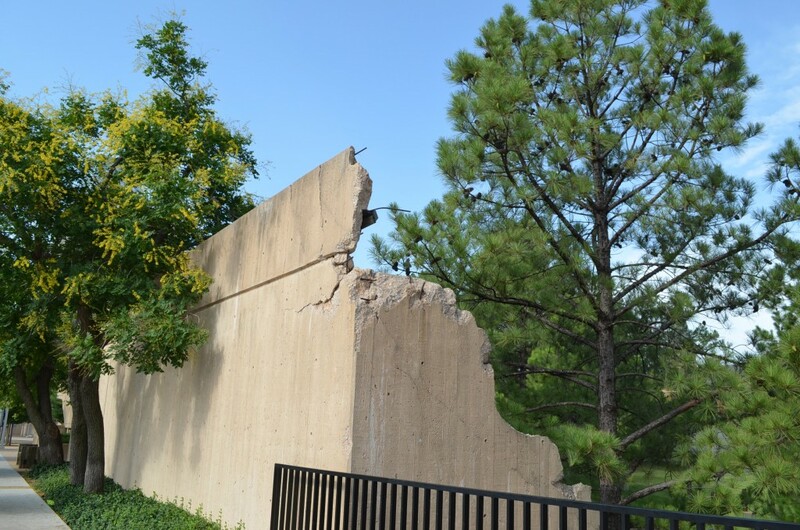 This impacted me more than anything else about the memorial…seeing up close the power of that truck bomb. Standing at one end of the reflecting pool, you can see the 168 chairs. 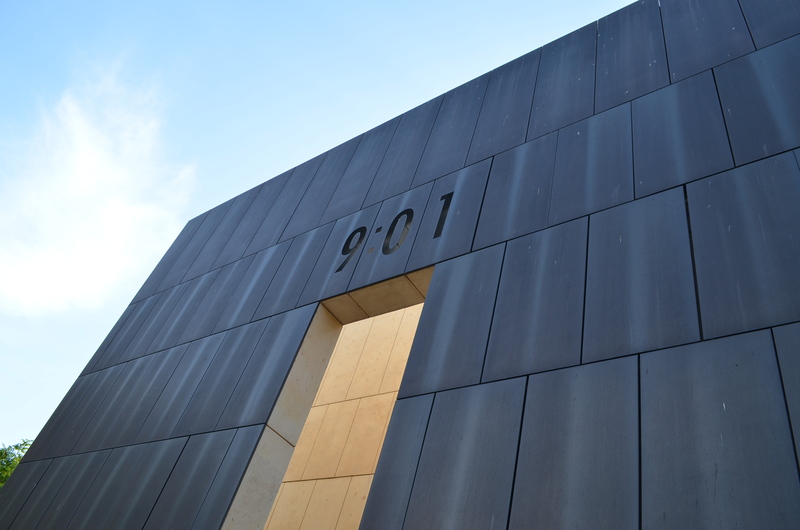 The wall at one end of the reflecting pool reads “9:01”, the minute before the bombing. The other side reads “9:03”, the minute after the bombing. The chairs have lights at the bases, and you can visit this area at night. It’s been described by one of my friends as “haunting” at night. 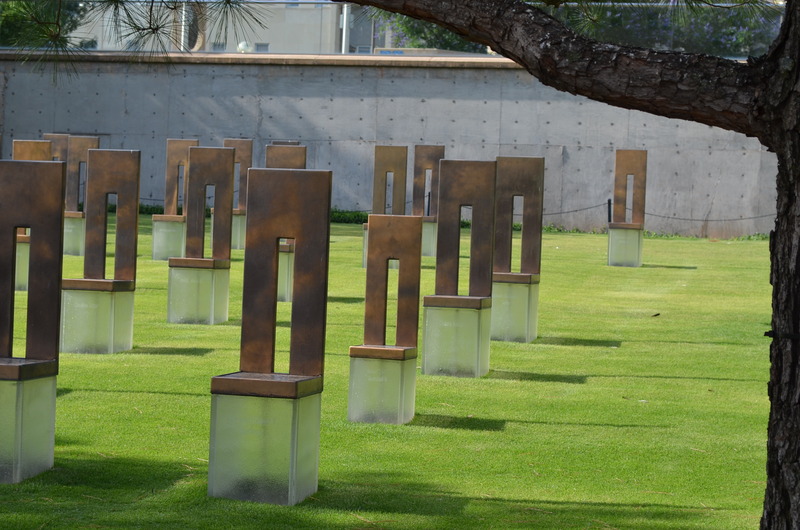 The names of the victims are engraved into the clear bases of the chairs. Note the small chairs, those were the children. We had Howie with us, and after about 20 minutes of wandering around the grounds, a security guard told us that dogs were prohibited…so we had to leave. The gentleman was quite kind about it, and even suggested we could “take our time” as we made our way to the exit gate. After that diversion, we hopped in our vehicles and headed westward. The song is right. 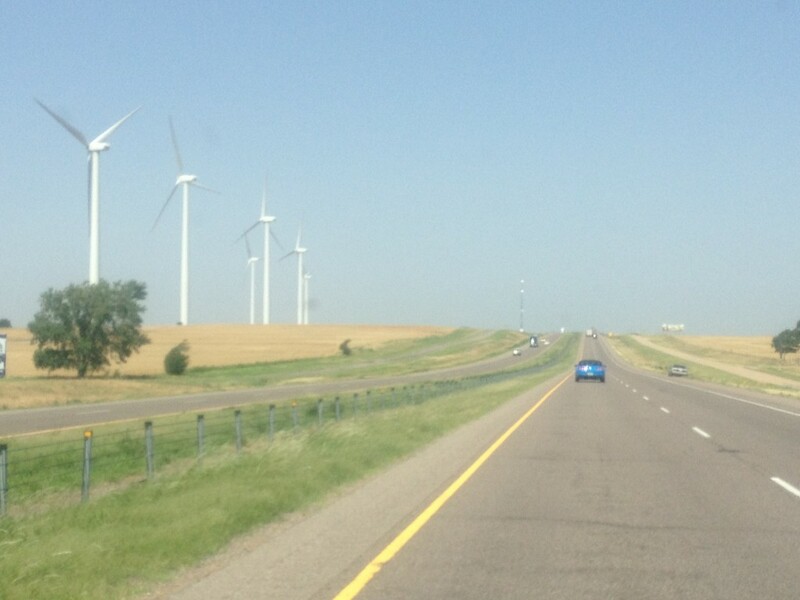 Oklahoma IS where the wind blows. There were gusts well into the 35-knot range…we could really feel it when we’d get to the top of a rise and the trailer would buffet some. Dave reported that the wind make things in the Mustang very loud. There were a lot of windmills. Makes sense…since Oklahoma’s where the wind blows, right? Despite the issues they’re causing, I’m always awestruck at the sheer size of those windmills throughout the plains states. 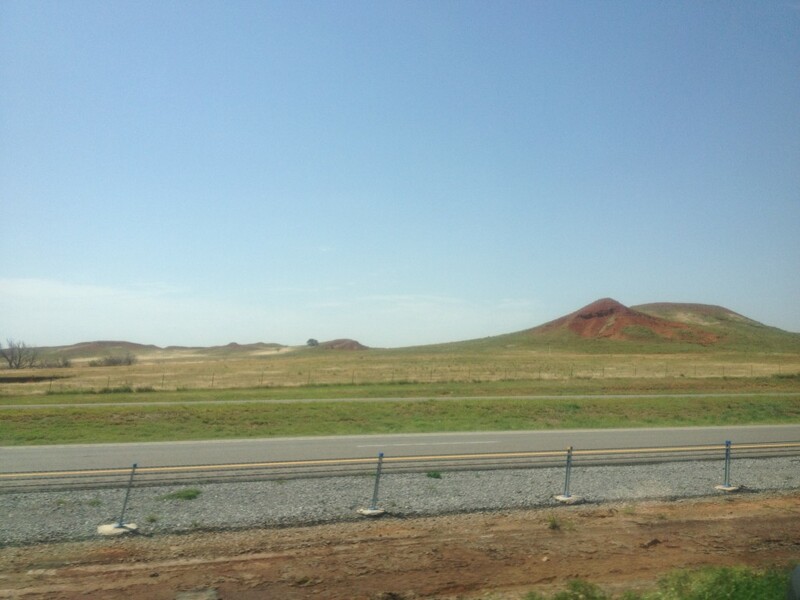 We were gradually increasing in elevation all the way across Oklahoma. My curiousity prompted me to download an app called “Current Elevation” for my iPhone somewhere in Oklahoma. Then as I drove along, I could see the elevation increasing. This was great for the rest of our trip. The famous Route 66 parallels I-40 in western Oklahoma. There were numerous billboards advertising historic Route 66 attractions and souvenir shops, but we didn’t stop. I would loved to have stopped at the Route 66 Museum in Clinton, OK. For another time. 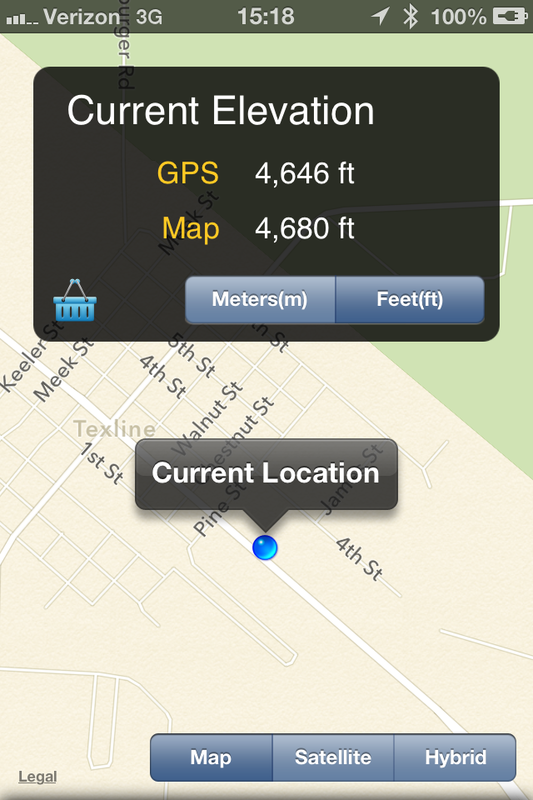 I took this screen shot from the Current Elevation app near the TX/NM border, during our gas/restroom stop, probably. We stopped for lunch in Amarillo. This was somewhat tricky because the temperatures were well into the 90s, so we needed to find a drive through or a place with a picnic setup (such as a Sonic). We ended up at a Whataburger. Amarillo is where you get off the interstate and begin trekking northwestward towards northern New Mexico. For most of the Texas part of this drive, which was on U.S. Highway 87, we were driving past flat farmlands that were heavily irrigated. During midday, we could see the enormous center pivot irrigation systems in full swing watering the corn and wheat fields. Which results in those distinctive “round farms” that you can see on maps or when flying over west Texas on a clear day. 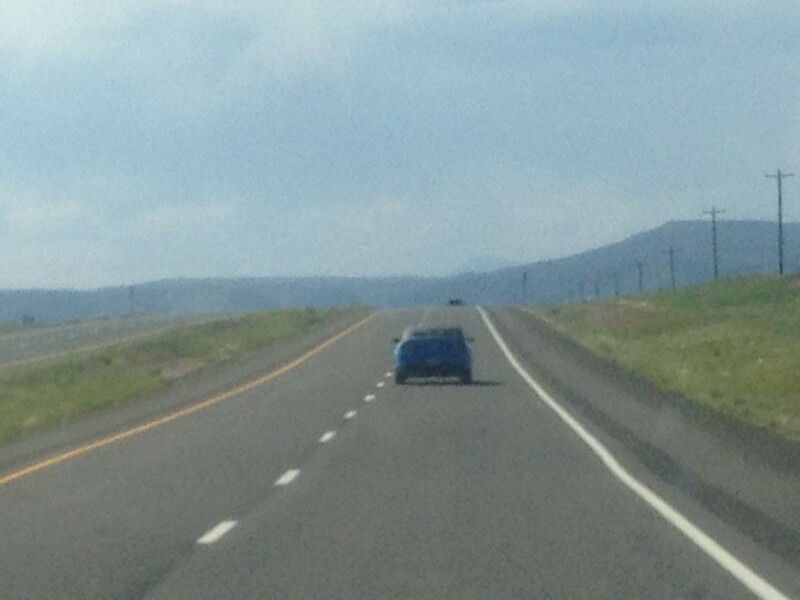 But once you cross into New Mexico, the landscape changes drastically. Mesas become more widespread, and we continued to ascend…from 4500′ in north Texas, to 6600′ by the time we reached Raton. The wall of mountains slowly emerged on the horizon, and we drove about 80 miles towards it. The wall of mountains never ceases to amaze me. When we got to Raton, we realized what a small town it really is. Dave and I checked into the Holiday Inn Express, get Howie settled, and then enjoyed dinner at the “Historic Icehouse” which was a BBQ restaurant. 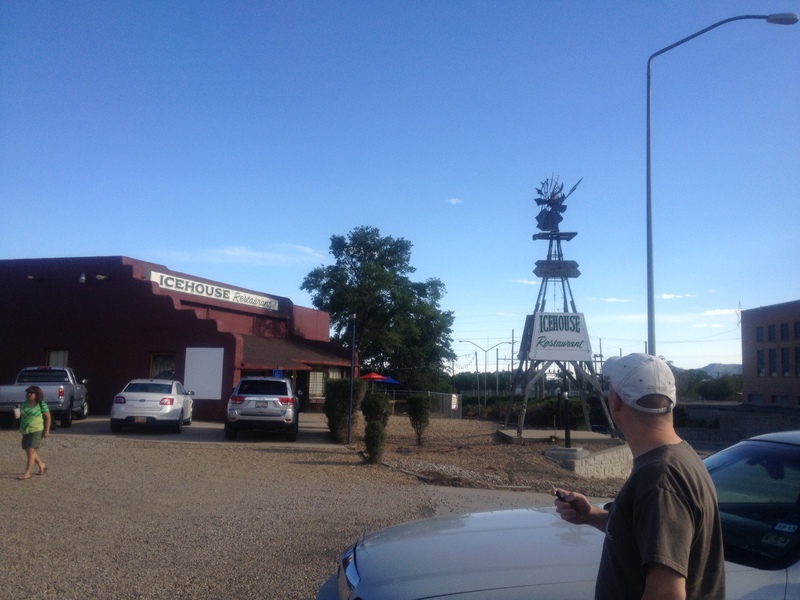 We did some driving around the town; it appears most of the business is tailored towards the BNSF railroad yard in town. The Historic Icehouse was exactly that once upon a time. It now serves BBQ. It probably loaded ice onto train cars back in the day. 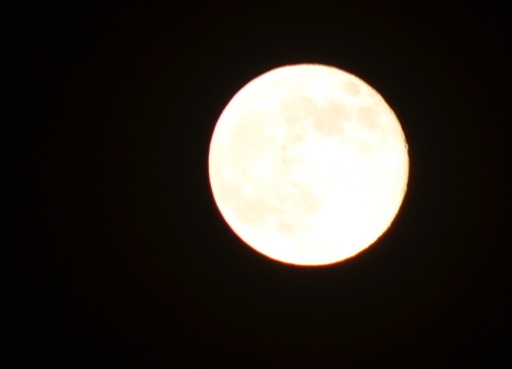 That night was the “Supermoon“, and I had some sorry attempts of getting a picture of it with our good camera. The best I could do with the June 23rd “Supermoon” over the sky of northern New Mexico. Off to bed we went — a very short drive is coming up — only about 2.5 hours to Colorado Springs!